Here you will find out what the best outdoor cat house is, especially if you are short on time. After a careful examination of some of the more popular outdoor cat house reviews, we have concluded that the unit you should consider is the Petsfit CHW200211. This model is made from wood panels that are 12mm thick, which is more than enough to handle the rigors of the big outdoors. The paint used is water-based which means that it is entirely safe for pets and will not peel over time. The asphalt roof will protect your cats from those pesky raining days. If our first choice is not available for sale, you might want to take a look at the Petsfit CHW20141ZB0201J. 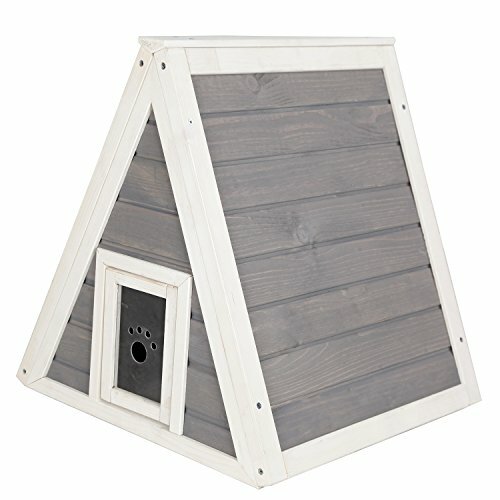 The pet house is made of cedar which is a kind of wood that is rot-resistant, a feature that makes it an ideal material for an outdoor construction. For easy cleaning, the slats are not butted up against each other and that will also provide a better ventilation during the hot days. You should be mindful that if you have a pet that likes to chew and is destructive, this might not be the house for you since the cedar can easily split under these conditions. 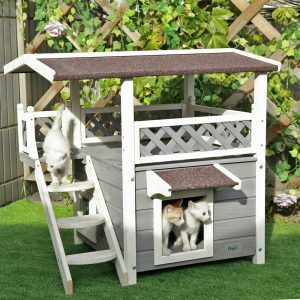 The compact nature and the quality construction of this unit make it an excellent outdoor shelter for your feline companions. The weatherproof house is designed specifically with enough room for large cats and even small dogs. It comes with feet that will keep it slightly up to prevent rain from getting in. The bottom floor is also easily removable which will allow for a straightforward cleaning experience. Buyers were disappointed with the implementation of the flap door which does not swing open enough to let the cats in or out and that can be a huge problem during the winter. The CHW20141ZB0201J is a one-story house that manages to offer ample room for both your feline and canine friends. The two-story design makes this alternative perfect for pet owners that have cats that enjoy their privacy. It is very easy to assemble and has an asphalt roof to keep rain and snow from getting into the house. You also get acrylic doors that will keep out the wind and rain. Owners have found that for the house to last the longest, you should keep in under a covered area. Otherwise, it will not stand up to the elements despite the weatherproof construction. The Petsfit CHW2013 is a great purchase for owners that have more than one cat and want each to have a private place to call home. 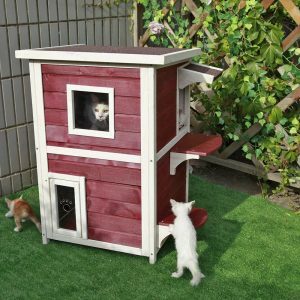 Finding a good outdoor cat house that can meet your needs can be a difficult task. Whether you want one that is big enough to house even your bigger cat bowls, or maybe one that can be used during the winter as well, we have something for everyone in our diverse list of products below. 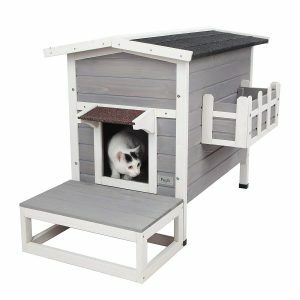 The two-story house is designed to meet the needs of multiple cats and is very easy to assemble since it comes with pre-drilled holes and a stair design that will create lots of fun moments for your pets. The upper door is perfect for you cats to bathe in the sun during a sunny day and has enough room available to add a comfortable cat bed. The asphalt roof will prevent rain or snow from getting inside the house and wetting the wood. Speaking of the wood, this model utilizes cedar, which is a rot-resistant material, making it perfect for any outdoor construction. The wood is guaranteed to last at least three years of constant outdoor use, according to the tests conducted by the manufacturer. What’s more, the paint used on all the wood is water-based which means that it is safe for pets and will not peel over time. To use during the winter, you will have to add a blanket, pillow, or heat mat inside the house. 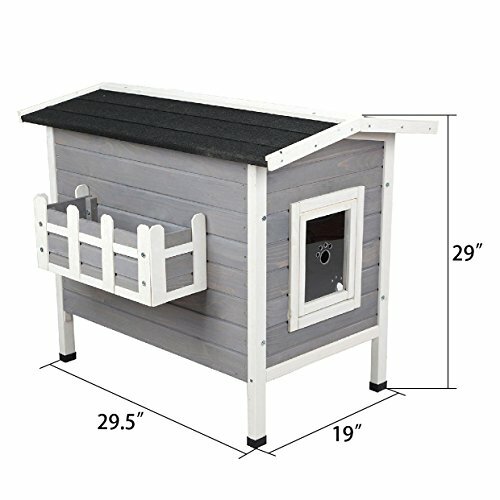 This versatile extra large outdoor cat house is perfect for outdoors since it features the use of weather-resistant materials. The roof is also made from asphalt which should guarantee that water will not get inside the house to disturb your furry companions. The unit is also quite roomy, meaning that it can be successfully used as a winter dog house, as long as you have a small breed. Indeed, the unit can handle a wide array of weather conditions, including the cold season, as long as you add a heat mat or a warm blanket inside the house. You also won’t have to worry about the materials being dangerous to your pet since the unit uses only natural wood and harmless paint that will not affect your little pal’s health. The shelter comes with a plastic flap on the back escape door which will help keep the warmth in during the colder days. For easy cleaning, the bottom floor can be removed. 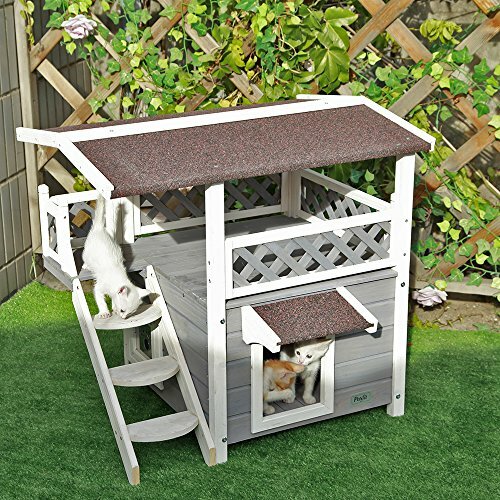 It can be quite tricky to find a worthwhile outdoor multi-cat house, but we believe that the Petsfit CHW2013 fits the bill quite nicely. The two-story condo offers more than enough space for your cats to sleep and for you to place some of their favorite cat toys inside the two rooms. The unit is easy to assemble since it comes with pre-drilled holes and the instructions are quite intuitive and straightforward, and it shouldn’t take more than a few minutes to get it up. The roof is made from asphalt, and that will help keep both stories dry and warm. 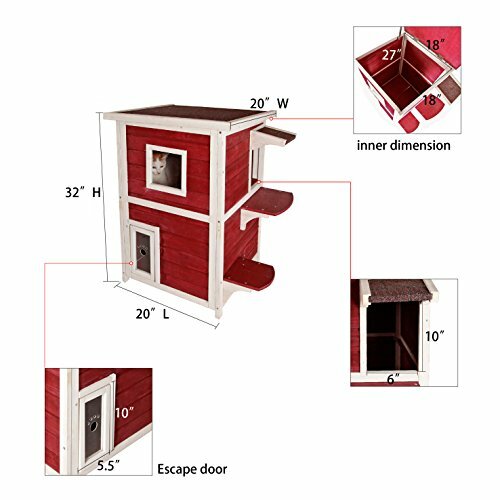 The balcony will allow your cats to reach the upper level quickly and safely, while the transparent escape door will allow the pet to run quickly if there is ever an emergency. As a plus, there is a hole between the upper and lower layer, and you can place the cat litter pan on the lower floor to make the cleaning process more manageable. The triangle design of this unit is quite interesting, and it has a clear purpose, that of allowing your active cat to stretch and play around and inside the house unhindered. The ample room available will let you place the cat foot mat together with the water and food bowl inside the shelter if you have a lazy feline. It is the ideal purchase for an outdoor cat since it comes with a back escape door meaning that your cat will not be helpless and trapped if she or he ever encounters a predator. It is built to fit one cat under 15 pounds. The neutral colors make the shelter a good match with all outdoor and indoor decorations. The wood panels are 12mm thick and made of cedar, which is a rot-resistant material, meaning that it is more than capable of handling the rough conditions of the outdoors. The paint is also water-based to ensure it is safe for pets and that it will not peel. 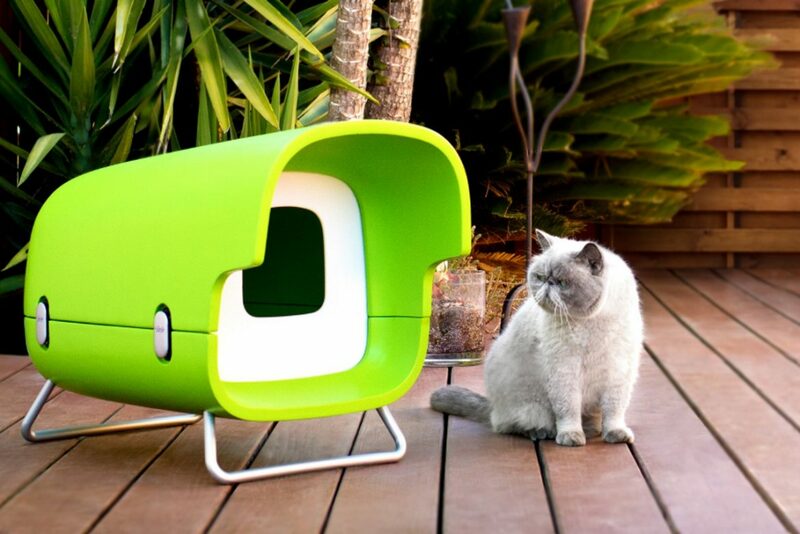 The Kitty Kat Condo follows the design of an igloo, and it shares the same philosophy of protection from the elements. 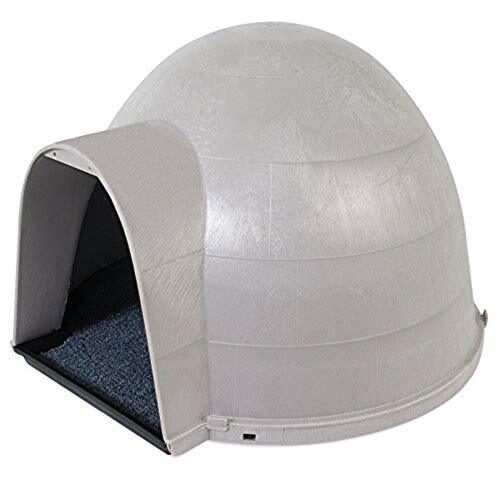 The rounded hood will direct snow and rain runoff away from the entrance to ensure that the interior will remain dry and warm no matter the weather outside. The unit comes together with a very comfortable carpet that will provide insulation and warmth for your cat. The carpet has a texture that will encourage scratching, and it is durable enough to handle the claws of your faithful companion. The outside of the cat house is made from a non-porous plastic which will prevent mold and flea growth for long-lasting comfort and a clean and safe environment. You can also take the igloo inside your home since it can be used as a private shelter both outdoors and indoors. Assembling the unit is also very easy, everything snaps in place easily and quickly with no tools required. With so many models available for purchase on the market, it can be quite challenging to find cheap outdoor cat houses that meet your requirements for quality and reliability. Products nowadays have so many features that many pet owners hesitate on which ones are the most important. To make sure that you will get a unit that is comfortable, warm, secure, and affordable, we have selected some of the features we believe to be paramount when looking to purchase such a product. Take a look below if you want to see more. Since most cat houses currently available can be rather hefty, if you are not handy with a hammer and nails, you can have a hard time assembling a complicated unit. For your own sake and because we know that people care about their time, we recommend that you get something that can be put together quickly with no need for extensive instructions. We recommend that you look for models that come with pre-drilled holes and snap-together pieces since these are the easiest to assemble. The good thing is that you won’t have to look too long for the ideal purchase since manufacturers will do their best to advertise this nifty feature. When it comes to size, you need to consider the number of pets you have and the space available in your courtyard, garage, or wherever you wish to place the shelter. If you have more than one cat, you can either get a roomy option or a two-story model. Getting a unit that features quality insulation is another critical factor that we wholeheartedly recommend that you consider. Insulation serves a dual purpose in the sense that it will keep warm in the winter and it can keep your feline cool in the summer. We recommend you look for thick walls or high R-value insulation. If you do wish to use the cat house during the winter, you have a couple of options. You can either get a cat house that comes with a heated mat/bed or get a multi-purpose option that allows you to add your own heated mat or bed during the colder winter days. With that being said, you should evaluate how much energy the heating system will use, and just how comfortable it will be for your cat. The danger with an outdoor cat house is that a predator could attack your cat and having just one door to escape is a big no. There are many models nowadays that feature an extra back door escape that will allow your pet to run free instead of being trapped by your neighbor’s dog, or worse. While we do recommend to place your outdoor shelter in a protected place, you should make sure that the unit you have in mind can still offer some basic weatherproofing. The roof of the house, in particular, should be able to handle both rain and snow.